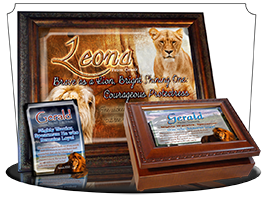 These framed name meaning prints are set in the beautiful backdrop of scenic vistas and outdoor beauties. 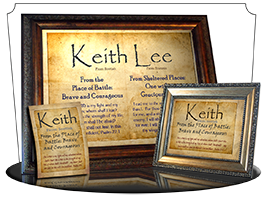 Encourage and inspire others with these unique name meaning prints, framed with your choice of frame. 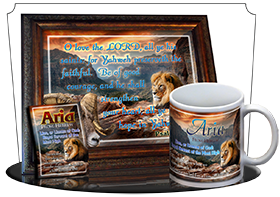 As you can see, the lettering for the name and meaning and Bible verse interacts with the background with special effects, making these scenery designs a beauty to behold, and an inspiration to receive. If you'd like to know what a name (or a list of names) mean before you order, just click the chat box below, or e-mail us. Strong, snowy mountains rise into the clouds on this wilderness backdrop. 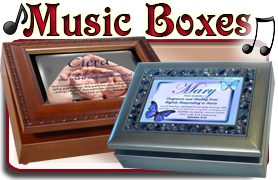 Personalize the name right into the misty clouds, with the meanings featured at the treeline and the verses in white against the blue mountain lake. 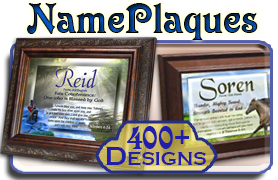 NG-8x10-SC26 8x10 Prints in 10x12 frames for 1, 2 or 3 Names & Meanings! NG-8x10-SC22 8x10 Prints in 10x12 frames for 1, 2 or 3 Names & Meanings! A lush green garden is the peaceful setting for this name meaning. 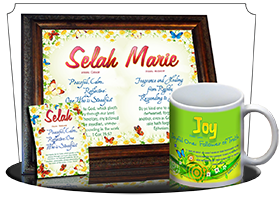 Personalize with 1 or two names, and we'll include the origins, name meanings and Bible verses. The corners are decorated with a weaving vine, with a wooden bridge crossing a blue stream in a royal, bountiful garden. 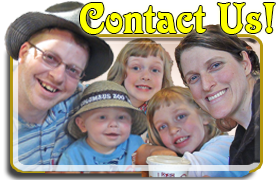 The matching pocket card is white, with leaves accenting the corners. 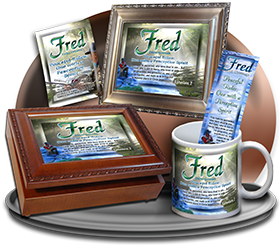 NG-8x10-SC08 8x10 Prints in 10x12 frames for 1, 2 or 3 Names & Meanings! 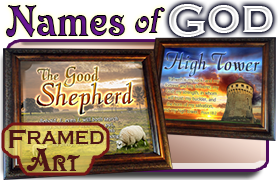 NG-8x10-SC07 8x10 Prints in 10x12 frames for 1, 2 or 3 Names & Meanings! Cute little red ladybugs brighten your day with a cheerful green backdrop of leaves and water. 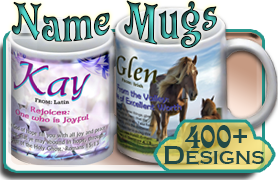 The name and name meaning are in blue and red, both in super-friendly, happy fonts! 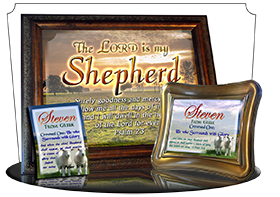 For the sample, I chose my mom's name, Jeanne, which means "God is Gracious: One who is appointed of God"
NG-8x10-AN61 8x10 Prints in 10x12 frames for 1, 2 or 3 Names & Meanings! NG-8x10-GR01 8x10 Prints in 10x12 frames for 1, 2 or 3 Names & Meanings! 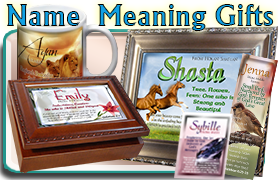 NG-8x10-SC14 8x10 Prints in 10x12 frames for 1, 2 or 3 Names & Meanings! Golden harvests lit by the morning sun are sure to encourage the bearer of this name! 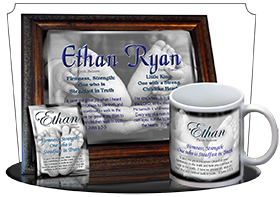 Personalize with one, two or three names at once, and we'll include the origin, meaning and verses. 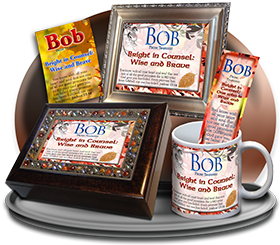 The matching pocket card uses the same scene, while the bookmark features a single shoot of oat grain, and the matching greeting card features the name meaning against a bright orange sunset, a field and a dirt road. 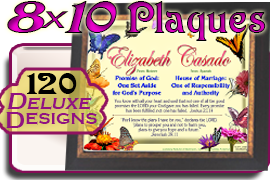 All beautiful additions to this multi-name-meaning plaque! NG-8x10-SC27 8x10 Prints in 10x12 frames for 1, 2 or 3 Names & Meanings! NG-8x10-SC28 8x10 Prints in 10x12 frames for 1, 2 or 3 Names & Meanings! NG-8x10-SC33 8x10 Prints in 10x12 frames for 1, 2 or 3 Names & Meanings! 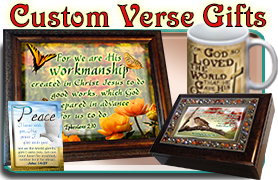 NG-8x10-SC36 8x10 Prints in 10x12 frames for 1, 2 or 3 Names & Meanings! NG-8x10-SS10 8x10 Prints in 10x12 frames for 1, 2 or 3 Names & Meanings! NG-8x10-SS11 8x10 Prints in 10x12 frames for 1, 2 or 3 Names & Meanings! 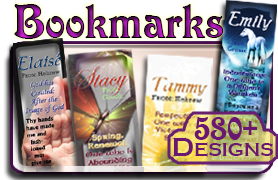 NG-8x10-SY56 8x10 Prints in 10x12 frames for 1, 2 or 3 Names & Meanings! 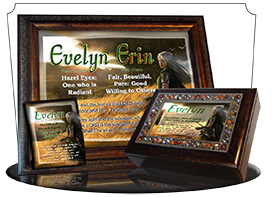 NG-8x10-WA02 8x10 Prints in 10x12 frames for 1, 2 or 3 Names & Meanings!